Discussion in 'GPS Tracks - Central, Texas & Gulf States' started by Cannonshot, Oct 12, 2008. 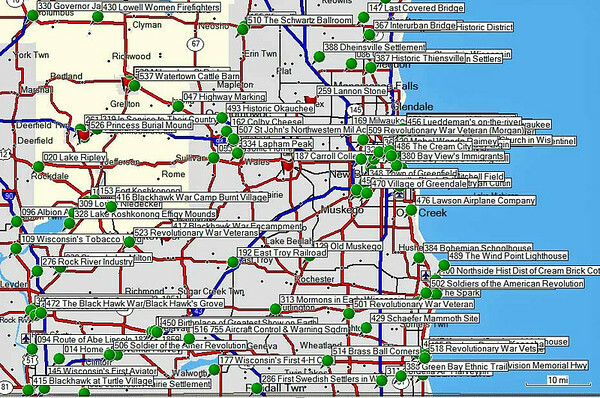 The attached .gpx contains 512 waypoints of Wisconsin Historical Markers. When I was researching the Pony Express ride, I came across some sites that listed Wisconsin Historical Markers and thought it might be a useful project to compile and waypoint them for others to use. Since then, benp1981 has expressed a lot of interest in the file so I did a rush job to finish it up. Rush job means there are probably a few minor mistakes. Let me know of any corrections that need to be made and I will update the file. 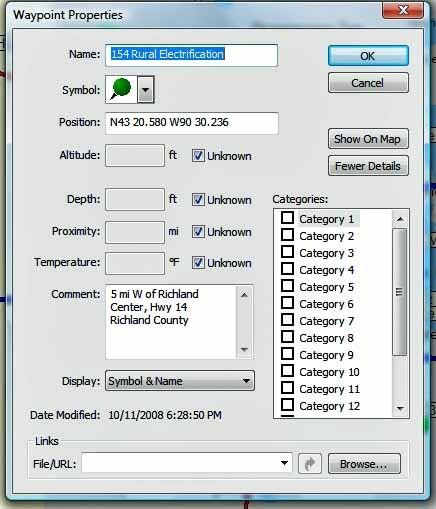 The waypoints are keyed to a 16 page spreadsheet file that contains reference numbers, more details about the waypoint and it's location, what region the waypoint is in, what county, coordinates, and a clickable link that leads to a website that has a picture of the marker and other details. The SSF also lists whether there is a photo available and whether the exact coordinates are known. About 25 don't have photos. The 75 sites with the coordinates listed in red have only approximate coordinates based on a street description and need further work and refinement. The coordinates listed will get you there though. Post refinements for the red coordinates to this thread and I will update the spreadsheet file. Some ambitious sorts might want to log into a couple of the marker websites to help complete their database if they refine some of the points that need development. Some ambitious person might also want to convert the spreadsheet into a database as some useful sorting could be done. As for me, I spent way too many hours on this project already and have taken it to a point where it is useful as it stands. Since it is now my time to migrate to the Mississippi River to hunt and fish for a couple of months, I am off this except to make corrections. Excel users will be able to do sorts using just the spreadsheet by region, county, etc. The .gpx is fine, but a good tool to have as a companion is the spreadsheet file. PM me an e-mail address and I will send it to you. The SSF also lists whether the marker is standard, small, or two sided as it helps to know what you are looking for. Armchair warriors can just sit and click on the links to read each marker without ever leaving the house. One way to use the file to enhance your other rides would be to copy the waypoints that are along your route from this file into your ride file. Or, you could take a neighborhood cruise to check out some markers. Even without the spreadsheet, the waypoint properties have additional info in the remarks block as to the location of the point. Could be useful on the road. PM with an e-mail address for the spreasheet or a .gdb. Hope you get some enjoyment out of this. Edit: Keep in mind that some GPS units only take 500 waypoints and won't take all 512 of these points at once. Check the specs for your unit. Tracks can be downloaded from another site by clicking here. This site contains about 138,000 waymarks worldwide. You can sort them and find lists of state historical markers. Most states in the upper midwest are included. The markers in the above site have good coordinates and usually have a picture. However, this is not a complete list of markers. You need to search your state historical society (or other agency that manages the markers) to find a complete list. The historical society list may only have a marker name and a brief location description. You will have to estimate the waypoint until a firm coordinate can be obtained. There are other sites on the web that list the markers but there is probably not a complete list on the web as things change. I think I was short about 75 markers that were not posted to the web. Also, there may be a book published about the markers in your state. There was one in WI that I located through the state historical society. PM if you are interested in taking on a project for your state and have questions about my experience. Edit: Wow, I just looked at Michigan and see about 1,300 markers listed. I just finished upgrading the GPS file for the historical markers. 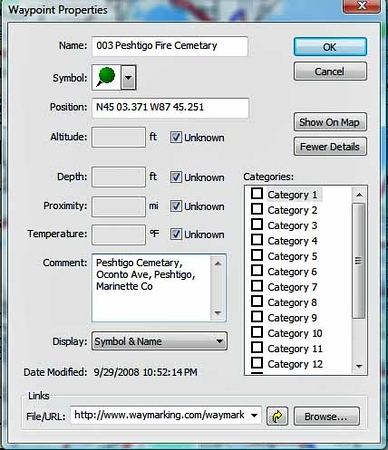 In addition to the street directions remarks, the files now also contain the URL for the individual marker's web page. So . . . much of the information on the matrix is not incorporated into the GPS file via "Waypoint Properties". Updated the GPS file and spreadsheet based on refinements on around 50 previously "hazy" points that BENRON tuned up when he rode all of these. There are still about 20 points that couldn't be nailed down. Still can't get files uploaded, so if you want them, PM me an e-mail address and I'll send them out. By the way, I am in the middle of another similar project at the moment that involves a couple of hundred other sites. Same kind of deal, a waypoint file you can look at to see what is along the route or in the vicinity of your destination. Replaced lost file. 3699 view on previous site.